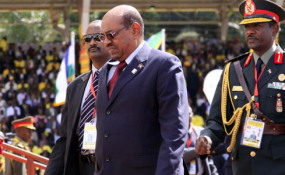 Can Al-Bashir Survive His Last Days in Power? Sudanese President Omar al-Bashir (file photo). Khartoum / El Rahad / El Geneina — On Wednesday, the fuel crisis returned in the Sudanese capital of Khartoum. The city saw long queues of vehicles for fuel and the main bus stations experienced huge crowds waiting for transportation. The Sudanese Oil Corporation has implemented the decision to restrict the use of petrol for the owners of private vehicles by limiting the filling of the vehicle once a week by a designated card issued by the Corporation. The chronic shortage of ready cash in Sudan's banks threatens to impact on agriculture. A number of farmers of El Rahad in El Gedaref state confirmed that they do not have sufficient cash to harvest the summer crops. They say that the contractors' companies have not provided cash for the cotton harvests. They have also failed to pay dividends to a large number of farmers since the previous season. Yesterday, West Darfur witnessed a severe liquidity crisis as the banks set a SDG 500 ($10.50) limit for cash withdrawals. A number of residents told Radio Dabanga from El Geneina that the liquidity crisis in the state has reflected negatively on the commercial movement, livelihood, medical treatment, and food. A trader told Radio Dabanga "The banks' decision to reduce the ceiling of the withdrawal of funds to SDG 500 because of lack of liquidity has led to discontent among bank customers". A similar ceiling was imposed in Khartoum state on Monday.